Qarabag FK, an Azerbaijani internally displaced soccer team, became the country's first club to make the Champions League group stage after securing an aggregate tie with Danish team Copenhagen on August 23. Nicknamed Atlilar (Horsemen), Qarabag FK have been the reigning kings of Azerbaijan’s Premier League Championship for four years running - a remarkable achievement for a team that has no stadium and has not played a home match in over two decades. The Horsemen’s last home game, in Agdam, was played on May 12, 1993 under artillery fire from Karabakh-Armenian forces. (The region's name is variously spelled Qarabag, Garabag, but most commonly Karabakh.) The team's home ground, Imaret Stadium, was later occupied and reduced to rubble. The surrounding town suffered a similar fate: its entire population of nearly 40,000, nearly all Azerbaijani, fled. Today Agdam is occupied by Armenian forces and has the dubious honor of being the world’s largest ghost town. Aghdam's former residents now live in refugee settlements outside the occupation zone and until recent years, Qarabag sent a bus to these refugee settlements every week to transport the team’s supporters to their games. The team’s tragic history was not its only obstacle to success; Azerbaijan’s corrupt local politics have also hamstrung their efforts. In 1996, Qarabag had fought to secure their victory in Azerbaijan’s Premier League, with a three goal lead needed to clinch the cup. But the then-head of the Azerbaijan Football Federation, Fuad Musayev, was a fan of the rival Neftchi Baku, the “Oilman’s” club, and intervened to secure Neftchi’s victory over Qarabag. The horsemen would not win another title until 2014. Since then, though, Qarabag has established itself as a dominant force in the country’s football scene, as well as representing Azerbaijan internationally in the Europa League and Champions League. Meanwhile, it's become a sort of darling of the international press, becoming the subject of a book and film. However, it's a safe bet that Azerbaijan could squander that international good will by politicizing the team's success. A story on the website news.az, headlined “Armenia was defeated by FK Garabag in European propaganda space,” suggests that Europe (or at least its soccer fans) will now associate Karabakh with Azerbaijan rather than with Armenia. 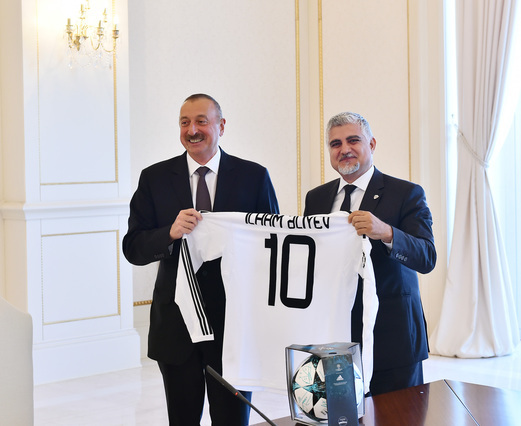 Blurring the political lines further, Qarabag received substantial sponsorship from Azersun Holding in 2001, a conglomerate reportedly tied to the family of President Ilham Aliyev. Aliyev met with the team a day after their victory and expounded on the political significance of their win. “Qarabag FC is named after Karabakh, the team represents the city of Agdam that is under occupation, so your victory is very important ... It's not just a sport victory, it's the victory of our state,” he said. “We are gaining victories on the battlefields, and in the sports arenas. In the same way, in April of last year, the heroic Azerbaijani servicemen, having shown heroism and courage, liberated a part of our lands from the Armenian occupation," he said. "Now the flag of Azerbaijan waves on these lands and you raised the flag of Azerbaijan in football yesterday."